Kristen and Sean celebrated their marriage with vows at St. Luke the Evangelist and a reception at Forest Park Golf Club. Here are some amazing images from Caretto Studio. Kristen’s bouquet was one of our favorites. She wanted soft colors and lots of texture and trusted us with the rest. She carried a loose mix of snapdragons, berries, garden roses, cremones, and anemones to create this look. The maids carried similar textures and flowers, but with brighter shades of blooms. 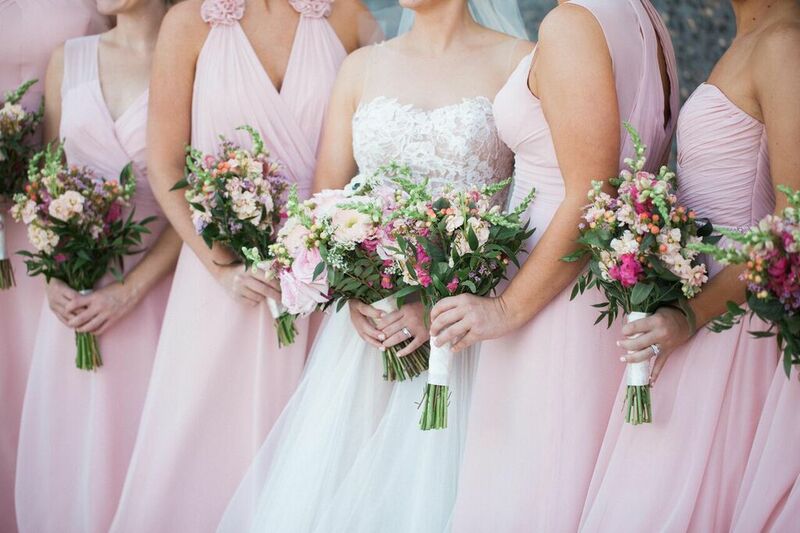 The bright tones really popped off of their blush bridesmaid dresses. The two bouquet types were complimentary in texture and shape, but there was no mistaking which was the bridal bouquet! As a nod to the beauty of Kristen’s bouquet, Sean wore an anemone boutonniere. The pews at the church were adorned with these textured clusters of mixed greenery. They provided a lush and natural aisle for the ceremony. These little sweethearts did a great job! It was such a beautiful day for a wedding and we were glad to be a part of it! Thanks, Kristen and Sean!